Environmental issues are important to us. With each villa reservation, we plant a tree in Indonesia for you. Together, our forest is already over 3000 trees strong! Read more about our commitment here. Mauritius may be known as a beach paradise, but there’s much more to the island than picture-perfect coasts. From nature attractions to cultural sites and historical landmarks, Mauritius offers something for every traveller. We’re happy to share our knowledge of the destination and to help you seek out the best spots for accommodation - so don’t hesitate to get in touch. A diversity of attractions awaits in the north of Mauritius. While the scenic Grand Baie is one of the first destinations to come to mind, the region is also home to colourful cultural attractions, picturesque botanical gardens and local boutiques. A vibrant dining and nightlife scene adds to the destination’s allure. The east coast of Mauritius is home to the island’s most gorgeous beaches. The highlight is Belle Mare beach, a pristine white sand coast that stretches over several kilometres. Beyond the beach, plan your sightseeing trips around the region’s natural caves, lava tubes and the Bras d’Eau National Park. Mauritius’ southern coasts are known for its incredible landscapes - from rugged coastlines formed by waves, to white sand beaches fringed by cliffs and extensive sugar cane fields. Our favourite activities here include soaking up the lively ambience at local markets, enjoying walks through well-manicured gardens and taking in the sights of cascading waterfalls. The western region is a great bet for water sport lovers. Sheltered from strong winds, the waters here are ideal for myriad activities - from swimming and sailing, to snorkelling and diving. Families will also appreciate the variety of kid-friendly attractions here, like national parks that offer breathtaking hikes, as well as dolphin and whale watching sites. The relaxed way of life in Mauritius encourages vacationers to take it slow, and to take in the island’s beauty in an unhurried manner. Staying in a single location, and using it as a base to explore the island through full or half-day tours is recommended. "Both on the phone and via email, Yannick was highly responsive and made the process of booking our villa so easy and pain free!" What can Mauritius-Villa.com do for you? Trust the Mauritius villa specialists! Our team has explored every corner of Mauritius to find the best villas for rent on the island. We inspect all the villas for you, so you can save time. Simply call us or send us a message to let us know what you have in mind for your holidays. One of our villa specialists will contact you within a few hours to find out more about what you are after during your stay Mauritius. We can be reached 7 days/week and speak English, Français, Bahasa Indonesia, Nederlands, Deutsch, 中文 and Español. Once we have all the details of your holiday plan, our villa consultants will send you a shortlist of available Mauritius villas for rent matching your criteria and budget. We have contracts directly with owners and therefore guarantee the lowest price for your villa, as well as a reliable view of their availability. We will request an option on the villa you like (at no cost). This options will leave you three days to chat with your travel party before having to pay for your villa reservation. Once you confirm, you will be invoiced by Mauritius-Villa.com, a Singapore company, guaranteeing a safe and secure booking. Our concierge team will arrange your arrival: we take care not only of your airport welcome but also of your villa check-in. 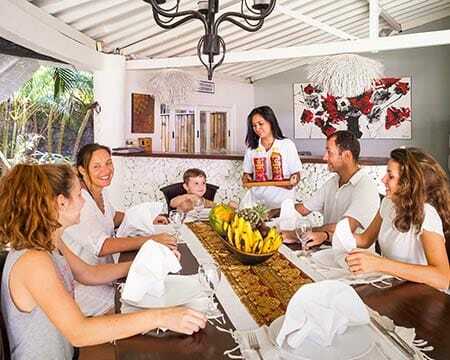 Once you have arrived in the villa, the staff is here to assist your group, with everything from day tours to explore Mauritius as well as in-house chef and meals, or babysitting services. For any special requests, you can call our team of concierges, 7 days/week to cater to your every travel need. Mauritius-Villa.com: renting Mauritius villas the easy way!